I recently wrote a post about finding information in other's trash. I just wanted to expand a bit on that. First Jack wrote a great article on Dumpster Diving. He points out how con men get stuff from the trash to use. I debated if I should give a "how to" on making a trash run. I decided to - whether to do it as your own detective, or what to watch for. First - I want to point out that trash is considered abandoned property. Once the trash is taken to the curb, you no longer have ownership of it. The containers you do, the contents - no. You will likely have a "target" for the trash run (unless you are a lousey crook that wants to commit identity theft). Find out from your city when the garbage runs are made. Now make your plans carefully. The trash run is best made with a pickup truck or panel van. If your target uses trash bags - great! It makes it so much easier. Go by the target in the early morning hours after the trash is set by the curb. You can grab the trash bags and toss them in the back of the truck and take off to your sorting site. You will need a well ventilated garage or if it is not raining - a back yard can do. Spread out plastic (it WILL be messey!). 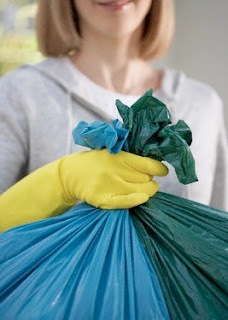 Use latex or plastic gloves and go through the trash. Have extra bags ready to toss out what you don't want. Invariably the best stuff with information is stuck to a dirty diaper or has puke on it. You can dry and keep the paper or copy the information with a pencil and note pad. If you have done this before you will understand why I do not say pen - they fail, or don't work, and you will likely want to toss it after the job is done. After you are finished - you will want to roll up the spread out plastic and throw that away. If you are really worried about getting the crap (literally) on your clothes, there are throw away painters suits and such that are not that expensive. You can cover up with those first if you like and just throw them away when you are done. You can use regular shopping bags from Wal-Mart and duct tape to protect your shoes -very cheap , yet effective. In some cases - you may need to purchase matching trash containers ahead of time and just swap them out. That is the easiest, Even if your target realizes the containers were swapped - it is more than likely too late. So now you know how to make the trash run. Have fun!. I never knew that once I put my trash on the curb that it was no longer considered abandoned property. I am completely amazed that people actually do this and apparently there is a whole system to it. I really need to watch my trash. This is so weird to me. HNWM - yeah it is all abandoned property once you do that- it is no longer "yours"
Great post, Barry. You sure covered--like blanket--all the pertinent points that I did not. Jack - I had an earlier post - similar to yours - just a different perspective. I have to admit, I was inspired to write the "how to" after reading your post. Congrats on the 50+ comments too!